As pharma celebrates its 16-year high NME approvals, productivity of certain disease areas including oncology certainly fall behind. Oncology diseases are the most complex in terms of research and development. At the research stage, target identification has been a major challenge due to the high toxicity of potential drug candidates. At the development stage, pharma has failed to add significant value in terms of safety and efficacy. Complexity of cancer diseases is proven by the low approval rates as opposed to other therapeutic areas (Figure 1; Kola and Landis, 2004). Figure 1 shows that the overall success rate of Oncology drugs is half of that of all other areas (on average). Although oncology approval rates are low, according to IMS Health oncology market has the largest share compared to other disease areas ($US 42 bn, ~7% of global pharma market) with compound annual growth rate (CAGR) of 10,5% (Figure 2). 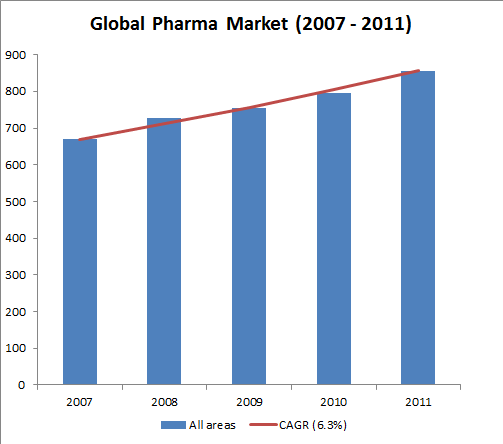 The global market for pharmaceuticals (all areas) is estimated to experience a CAGR of 6.3% (Figure 3). Prescription drugs that were active in the market between 2007 and 2011 were found to be ~5,700 in number. Similarly, the number of oncology drugs was ~500. Aggregate sales (in period 2007 to 2011) for oncology and all therapeutic area drugs was US$ 262 bn and US$ 3801, respectively. This results in average sales per product for oncology drugs US$ 524 mn (aggregate sales / # of products active in the market) and for all drugs $US 668 mn. Assuming even sales each year, oncology drugs achieved, on average, sales of $US 105 mn (per product per year) while other drugs, sales of $134 mn (per product per year). The analysis above shows that both R&D and market productivity for oncology drugs is lower than other therapeutic areas. 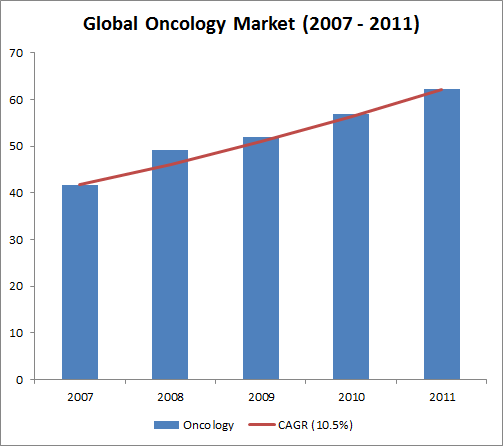 In addition, a thorough analysis from EvaluatePharma shows the oncology market outlook in 2014. 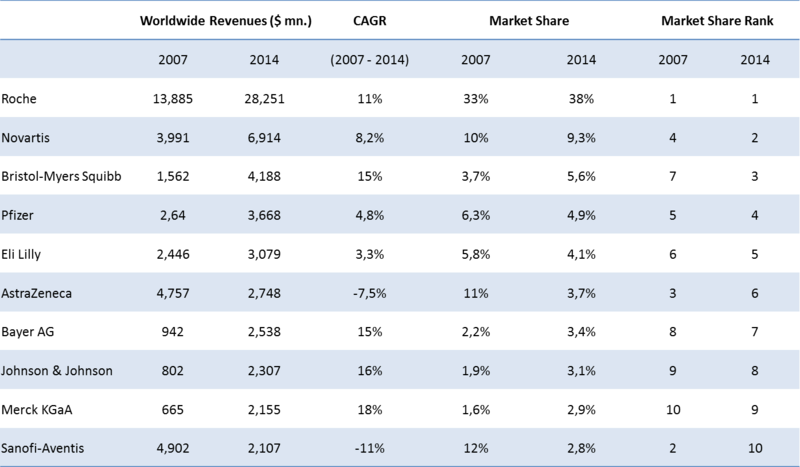 What is interesting, is the dominance of Roche (with Genentech) in the market as well as AstraZeneca’s and Sanofi’s market share shrinking (projected – see figure 4). Cancer prevalence: The main reason that the market is growing faster than other areas. Increased cancer prevalence is associated both with population growth as well as with increased life expectancy. Early diagnosis: Due to emergence of advanced imaging techniques and computer simulations it is diagnosis has been more efficient and diseases can be detected earlier. Academic collaborations and partnerships: Pharma and biotech companies, in order to reduce both the high R&D costs and risks related to cancer drug discovey, they form strategic alliances and partnerships with private academic institutions or funds. A high amount of government funded institutions are also involved in such deals. This is a major driver in the field of oncology. Blockbuster presence: Although oncology drugs’ sales per product are lower than overall drug sales, approximately one sixth of blockbuster drugs are focused on cancer diseases, implying that oncology market profile is skewed towards high sales drugs. This makes oncology market more attractive for pharma companies. Duration of treatment: As in other disease areas, drugs have succeded in extending patients’ life and therefore prescription of medicine is increased. Cost containment: State funding for all industries has been reduced (U.S. and Europe) the past few years due to the financial crisis that has affected all areas including healthcare. As an example, the National Insitutes of Health (NIH) reduced R&D budget (compared to last year) for the first time in its history. This shows the efforts made to stabilise the upward trend of R&D spending. Moreover, the US$ 85 bn cut implemented by the US government is expected to decrease NIH spending by approximate 5% in 2013. Patent Cliff: Patent expirations between 2010 and 2014 put at risk at least US$ 100 bn and major oncology drugs are at stake. Licensing agreements have proved to be more efficient from both a strategic and financial point of view, especially when it comes to oncology. A licensing deal made at a late stage will have high upfront values and low (development) milestones (high probability of approval). Instead a licensing deal involving a product at an early-stage will have a lower upfront value and higher milestones (low probability of approval). Therefore, there is a reduction of value loss compared to the event where a company executes a project on its own. From a strategic point of view, every-day decision making and managers’ time and effort dedication (of the licensee firm) to clinical trial projects is not destructed, since only financial compensation is granted to the licensor depending on the outcome. In my view, there are two ways to cope with the challenges of the oncology market. The first one is licensing agreements (as discussed above) which may make pharma companies more efficient by capitalising on biotech’s leading technology research platforms and scientists’ expertise. This suggested solution can reduce the effect of cost-containment as well as the major patent cliff faced by the pharma industry. The second solution would be to better understand oncology diseases and their complexity. This could only be achieved through a deeper dedication to research (drug discovery) in order to arrive to more optimised leads, which in turn it may result in more promising drug candidates.